Sixgeary is located in the small crofting township of Geary on the remote northeast coast of the Waternish peninsula. The cottage enjoys uninterrupted panoramic views across Loch Snizort and the Ascrib Islands, and further afield to the Outer Hebrideas. The Shed Tokavaig is a beautiful architect-designed house situated on the north side of Sleat between Ord and Tarskavaig. 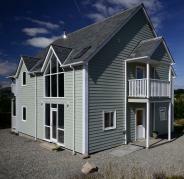 The property offers views to the Cuillins and towards Rhum and Canna. An ideal base for exploring Sleat 'the garden of Skye'.